Built-In Wireless Charging Now Available! World's First Integrated Inductive Charging. Evodesk advanced options are designed to elevate your standing desk's potential. Add one or all to make your Evodesk uniquely you. One desk. Three Power Options. Freeport power dock provides 1870 watts of pure power through 8 surge-protected AC outlets & 4 fuse-protected USB outlets. The convenient under-desk dock minimizes cables while protecting your most sensitive devices. Freeport + delivers all the advantages of Freeport and adds a convenient front panel that brings 4 configurable high-speed USB ports and 2 3.5mm audio jacks within easy reach. Hide away your CPU (with our space-saving CPU Mount) and still enjoy access to all of its ports. Choose wireless and add built in inductive charging in the desk and out of sight. No wires. No clutter. 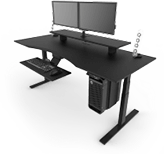 The Ergo Edge™ desktop was built to improve comfort for long hours at work or play. The Ergo Edge™ blueprint was perfected over the span of a full year using computer modeling. Each desktop is CNC machined into the complex shape with computer controlled precision. The arc of the desktop follows the natural curve of your body for a more natural way of interacting with your keyboard, monitor, and your work. The result: you’ll reach 22% more of your desktop. This optimal human position is scientifically proven to increase productivity. Free up your desktop and ease eye strain with Evo space-saving monitor arms. Adjustable, dynamic monitor arms promote healthy habits and allow you work longer without strain on your neck and back. Ergonomists suggest the ideal position for your monitor is 20-24” away and 10-15° below your eyes. Designed to work perfectly with SmartPass™, the Evodesk oversized cable management pass-thru is standard on every Evo. SmartPass™ conceals the monitor arm bracket for an ultra-clean desktop. Installation is easy and there’s no need to drill holes. For maximum versatility, each monitor arm can also be clamped on the edge of Evodesk. Choose from single or double displays in Carbon Black, Silver Metallic, or Polar White. The all-new Evodesk pods allow you to keep your most important tools close without taking up valuable space on your desktop. The Pod Plus storage space adds up to a massive 2500 cubic inches of quick-access space below your desktop. Store your favorite electronics, tools, and supplies within arm’s reach while maintaining the clean, uncluttered look of your desktop. There’s a huge number of power, data and phone cords on a typical workstation. Passing them all through the desktop and keeping them organized can be a real challenge. The Evo cable management tray is a must have option for those who like it clean and organized. Every cable and wire feeds into a full-width cable raceway that keeps your workspace clutter-free. Custom-fabricated from steel and then finished to match the Evo steel frame. Simplify your workspace with the custom made full-width cable raceway and say goodbye to tangled cables forever. A sleek, low profile treadmill allows you to exercise while working improving health. A whisper quiet motor, specifically engineered for walking speeds, keeps the treadmill running cool and quiet for hours at a time. The BioStepTM suspension with 6-point cushioning offers supportive shock absorption that protects your knees and joints. The Surgeon General recommends 10,000 steps a day and the Evodesk Treadmill lets you accomplish that with ease. Science has proven that standing periodically throughout the day can provide a myriad of health benefits. The perfect standing mat should be the right balance firmness and softness to ensure your feet have the correct amount of support without sacrificing comfort. Evo mats feature active, spring-like rebound that delivers the correct balance of softness and firmness. Its materials are inert, nontoxic, and built to last. Choose from a variety of colors and styles. The Evodesk programmable controller makes each transition quick and easy. Every Evodesk features a simple up/down button that can be placed on the right or left side of your desk. Upgrade Evo to the programmable controller to add LED height readout and four programmable memory buttons. After you’ve found the perfect height for sitting or standing, simply store it so that returning to your preferred height is automatic. The Evo ergonomic platform delivers the perfect keyboard and mouse position during standing and sitting. Eye, arm, shoulder and neck fatigue are reduced. It’s the key to staying comfortable all day long. Independent adjustment of the distance between your monitor and keyboard is easy. Position the monitor just below eye level and your elbows will form a 90 degree angle as recommended by ergonomist. Simply push, slide and store under Evo when desired. Made from high strength steel with a platform that perfectly matches the desktop. Evodesk has partnered with Harman Kardon® to create the ultimate integrated sound system . The stunning transparent, minimalist design catches your eye without being a distraction. The down-firing powered subwoofer is installed underneath Evodesk, out of the way and off the floor. Adjustable satellites allow freedom of movement. Touch volume and mute controls are within easy reach. The three piece 2.1-channel multimedia system features a down-firing subwoofer, eight full-range transducers and 40 watts of clean amplification. The result is a powerful sound system that goes beyond anything you’ve heard before. With the right equipment, there’s nothing to stop you from taking your goals by storm. Evodesk introduces three new user-centric solutions that include centrally located storage and a split level desktop. This keeps your tools close, and improves ergonomic positioning. Evodesk Pod adds 1175 cubic inches of quick-access storage space right where you need it. Casters turn your Evodesk into a mobile workstation. Oversized 3” wheels are built with solid steel axels and soft, durable polyurethane tires for smooth, even rolling on all surfaces. The casters swivel easily and quickly lock into place when you reach your desired location. With automated height adjustment, a future-proof expandable frame and smooth rolling casters, Evodesk adapts to your every need. Save desk and floor space for a clean, organized work area. The Evo CPU Mount’s space-saving design easily adjusts to fit most PCs, from 3.25” to 9.25” wide, and swivels 360° to give you convenient access to rear CPU ports. The high-strength all steel construction keeps your valuable CPU securely attached under the desk and out of the way. Not only is it a great organization tool, but elevating the CPU reduces dust intake and internal contamination, which helps extend the life of your PC. Available in matching black, silver or white. No modern workstation is complete without EvoFlex, the exclusive, high-performance cable sleeving. Commonly used in aerospace, military and automotive applications, EvoFlex will conquer all cables and conceal them neatly out of sight. Don't spend hours perfecting your workstation only to see a birds nest of cables and cords escaping from the back of your desk. Gently push the expandable, braided sleeving and it expands up to 150% of its original size and adjusts to any shape for bundling, managing, and protecting one or 20 wires and cables. Designed to look amazing and last forever, Metalix provides the ultimate chair mat surface. Metalix Glass is chemically strengthened through an ion-exchange process that creates a deep compression layer on the surface of the glass substrate. This layer acts as “armor” to protect the surface. This breakthrough process produces glass with exceptionally clean, smooth, flat surfaces and outstanding optical clarity. During the ion exchange process, smaller sodium ions are removed from the glass and replaced with large potassium. The larger potassium ions aggregate at the surface and cause the glass to become more dense, thus improving durability. Each Cable Management Kit includes a generous length of Evoflex, Powerbond Adhesive Bases, 4 inch cable ties, and 6 inch cable ties. Unlike lesser adhesive bases which often fail, Powerbond bases include a full square inch self-adhesive specially engineered to bond to any surface. Capable of holding even the largest cable bundles, each base is rated to a remarkable 10 lbs. Today’s desk may have a dozen cables running in multiple directions. Powerbond bases can be positioned anywhere they’re needed and rotated in any direction.